P1: As John Carter looked through the vapors above, he saw the princess being carried away by a monstrous bird. The durkoos had swooped down silently and clutched Dejah Thoris in its mighty talons. P2: Now it flapped to the top of a tall building -- to feed the girl to its young. P3: Dejah Thoris tore herself away and ran to the parapet. Far below she saw the Earthman. P4: "Stay in the sunlight, Dejah Thoris!" he shouted. "Sunlight will prevent the vapors from turning your body to stone!" P5: Then John Carter dashed into the dark building -- could he find a way to her side in time? P6: Meanwhile, the mother durkoos began nudging the girl toward its nest of ugly, screeching young. P7: Dejah Thoris smiled sadly. They would be grimly cheated -- for her body, affected by the vapors below would soon change to stone. 1. Strip #17 introduces a giant bird, similar to the malagors of the Tonoolian Marshes featured in ERB's Synthetic Men of Mars and in JCB's Giant of Mars. Since educated red Martians thought these giant birds to be extinct, years after the events of strip #17 took place, some explanation of them must be given in the Sunday strip novelization. Perhaps the narrator can say that the durkoos were extant large birds and that the specimen depicted by JCB was a one-of-a-kind kind among those birds -- a giant that nearly approximated the size of the later discovered malagors. Why the bird has an Earth chicken's head might not be so easy to explain. The narrator could, however, have learned of chickens from Vad Varo (Paxton) and merely mentioned their passing resemblance to the durkoos. CHAPTER 17: "THE VANISHED PRINCESS"
In its wetter, warmer days, Barsoom was the crowded abode of countless species of birds. But when the planet entered into its long downward spiral of death and decay, practically all of the feathered, flying things became extinct. Bevies of flightless birds still dot the more fertile spots on Mars, but their numbers too have been on the decline for centuries. Among the surviving birds of flight are the durkoos and the malagor, common examples of which sometimes reach the size of an adult man. Beyond these denizens of the air are the giant birds of Barsoom, which even today many Martians think of as mythological or prehistoric creatures. Under some circumstances, given a good supply of a certain kind of nourishment and a very long and healthy life, both the durkoos and the malagor may grow to possess wingspans twice or even thrice as wide as a man is tall. The curious reader might like to know that the region where sightings of the Giant Durkoos are most often reported lies between the Forest of Kaol and the dead city of Warhoon, though fossilized specimens have been uncovered as far south of Warhoon as the southern ice fields. Following the initial clawing and seizure of her body in the shadows, Dejah Thoris had no recollection of her body being carried through the air to the monstrous bird's nest. She was as alert as could be expected under the dismal circumstances. The only explanation she could think of was that the great bird's flight must have been a very short one. The girl guessed correctly; the nest of the durkoos overlooked the L-shaped plaza of Go-La-Ra, almost directly above the spot where John Carter had defeated Grombo the white ape. At least the air was more breathable on the rooftop where the huge feathered creature had released her. The maiden's affliction of rigidity did not abate in the least, but she felt that perhaps her being so far removed from the deadly fumes might retard the rapid progress of the calcification for a while. But none of that mattered; she expected death would soon overtake her. 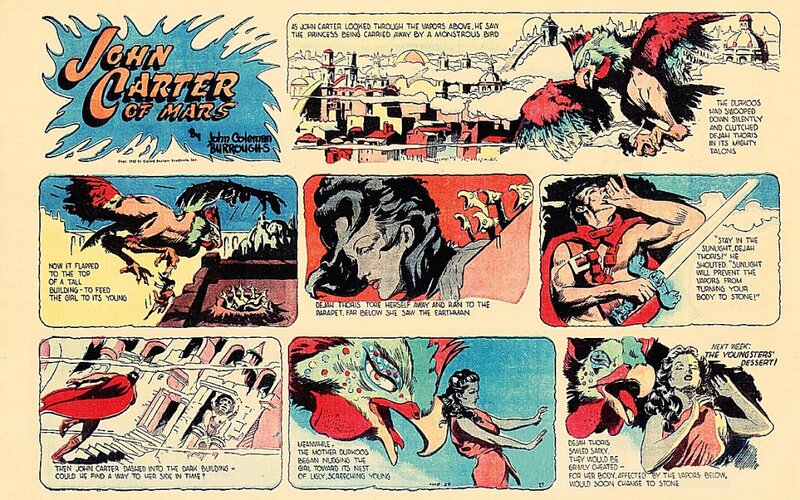 As John Carter looked upward, through the diminishing vapors, he saw his princess being carried away by a monstrous bird. Nothing he had seen since his advent on the planet prepared him for such a sight and he had to rub his eyes to be certain he was not hallucinating. Comparing the giant durkoos to earthly avian species, it looked to him something like a greatly enlarged eagle with the head of a prairie fowl. The female durkoos that carried off Dejah Thoris was easily six times the size of the largest bird Captain Carter had ever before seen. The thing that had swooped down so silently and so quickly clutched Dejah Thoris in its mighty talons, now flapped to the top of the tallest building fronting the plaza. Although the Earthman could not tell for certain, he correctly guessed the bird's purpose -- to feed the girl to its young nestlings on the rooftop. The enormous bird dropped the princess into the nest and then flew back down to the spot where it had captured her. The feathered chimera was thus absent from the roof for a couple of minutes and Dejah Thoris instinctively used that opportunity to trudge out of the great mass of rubbish which comprised the nest. The five youngsters appeared to be newly hatched and were not yet fledglings. So long as she retained some limited power of movement the nestlings did not pose much danger to her. However the piles of disarticulated bones the lay scattered on the rooftop, and which partly made up the material of the nest, indicated clearly what her fate would be once the mother bird returned. Moving very sluggishly, the maiden did not reach the parapet of the rooftop until the mother durkoos was fluttering back from her second trip to the plaza. In its beak was the flaccid body of a luckless reptile. The girl peered down into the plaza far below but John Carter had disappeared. More than half a day had passed since John Carter had left the campsite. Sola, daughter of Gozava and Tars Tarkas of Thark, sat with Woola the Martian watchdog in a most despondent posture gazing at the northern horizon. That was the direction the Earthman had taken when he rode off and it was the direction from whence the thoat returned a little before the sun reached its high point for the day. A couple of distinctive knots in the saddle thongs relayed the man's signal that he had arrived at Go-La-Ra safely. The three pinnacles she remembered from her past visits were, at most, only a few hours away on thoatback. But she knew nothing else regarding what might be transpiring in that dangerous place. She made up her mind, that if the Jasoomian had not returned by mid afternoon, she would trace the charger's trail back to the place where Carter had dismounted and begin a search for him and the princess. That meant disobeying the direct orders of the chieftain to whose retinue she belonged, but the green girl could think of no other option. Her greatest concern was that both of her human friends might be in grave danger at that very moment and that she was doing nothing about it. The gentleman from Virginia did not pause to enjoy the resplendent furnishings and decorations of the great building as he dashed through its many great rooms and grand hallways, trying to reach the roof as quickly as possible. But, after passing through one vast ballroom sort of chamber, which might have easily accommodated all the belles of Richmond, the ramp he had been ascending plunged into stygian gloom. Go-La-Ra had been built and abandoned well before artificial light was invented on Mars and there were no radium bulbs to be seen anywhere in the building. Captain Carter knew he was losing precious time by backtracking, but he had no other choice in solving his need for illumination. Once he had returned to the sunlit apartments, the Earthman sought out combustible materials, formed a pair of torches and set one of them ablaze with his Tharkian burning glass. All organic materials in Go-La-Ra suffer, to some extent, from the effects of the deadly mists, but in the case of the cloth and parchment he put into his torches, their calcification only served to make their burning a slow, sputtering process. Aided by this new source of light, he returned to the ramp and resumed his ascent. He could only hope he had taken a way that would not end somewhere short of the building's roof. "Can I possibly find a way to her side in time?" John Carter wondered. Then he met with something so deadly that only the torches could have saved him from -- such a peril as is found in the nightmares of the insane! Dejah Thoris watched in horror as the mother durkoos dismembered the dog-sized lizard with her sharp bill, and then proceeded to drop hunks of the still quivering flesh into the waiting mouths of squawking, blind chicks. The princess had never before heard a Barsoomian bird utter a sound, but then again, she had never seen a giant durkoos either. Soon the reptile's flesh was entirely consumed and the bones left to add their small contribution to the walls of the foul nest. Dejah Thoris smiled sadly. The nestlings would be grimly cheated, she knew, for her body was already so hardened that her arms clicked against the parapet of the rooftop, like the sound of one piece of stone striking upon another. Meanwhile, the mother durkoos had grabbed the girl in its beak and was carrying her toward its nest of ugly, screeching young.